PSI chambers are specialized designed to carry out stability & shelf list test on drug & drugs substance according ICH Guidelines. RH Sensor: Direct Capacitance type. Standard Model : Stainless Steel Mirror Polished Chamber and heavy gauge powder – Coated CRC exterior. 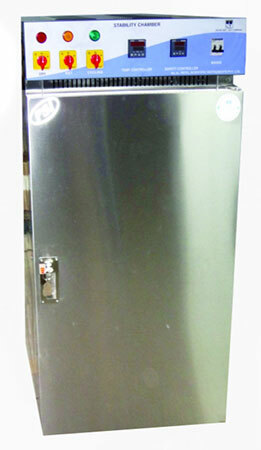 GMP model : Stainless steel mirror polished chamber and exterior of dull finish stainless steel. Double door : Inner full viewing door and outer door insulated with lock and key arrangement Control panel with electrical switch gear and refrigeration system (CFC Free) mounted on top for easy service accessibility. Multi Chamber data acquisition on Single Software. Auto logout, account Blocking and reactivating facility. Microprocessor Auto Tune PID Controller with Data Login System with Software.